There are so many RISD families around the world and we are always happy to get together with other RISD Alumni Clubs. This weekend, leading by our President, Mr. Donald Choi, we are delighted to welcome the next president of RISD Korea, Ms. Christina Kang, to Hong Kong. Donald and Christina would like to extend the invitation to you all to join lunch together. *Interested parties please RSVP to risdhk@gmail.com in order to reserve seats. **Separate checks will be provided. Enclosed please find the poster for your information. If you are interested, please RSVP to risdhk@gmail.com. Should you have any questions, please feel free to contact us. Looking forward to seeing you all! 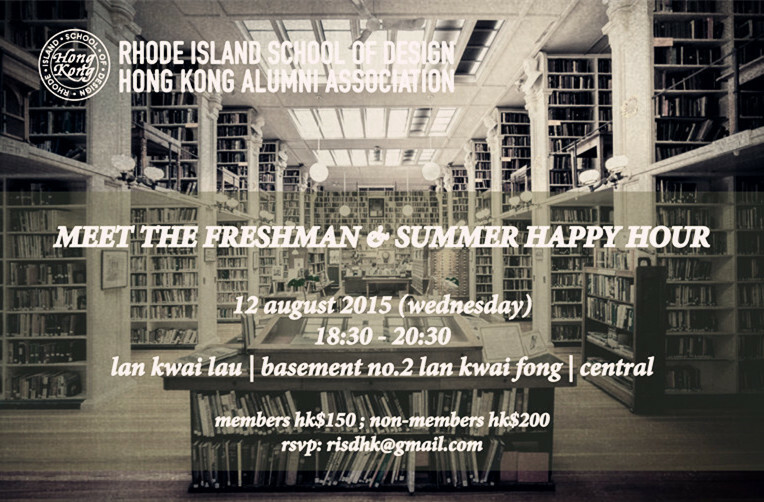 RISD Hong Kong Alumni Association cordially invited you to join “Meet the Freshman & Summer Happy Hour". You are playing an important role in shaping a new generation of elites in design industry, and this is a good opportunity for the freshmen to understand more about RISD. RISD HK is now co-organizing a Happy Hour event with Penn HK Club & USC Alumni Groups on 11 June 2015 Thursday evening. Let’s gather and make some new friends.